Monona Terrace is one of the hottest places for events in the summer. With concerts, dance events and so much more, this section of Madison provides plenty to enjoy. In addition, it's one of the best places for great views of Lake Monona. 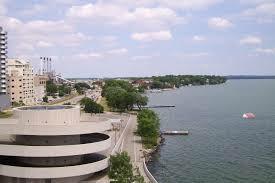 As Madison's premier convention center, Monona Terrace often holds conferences and meetings. However, there are many special events held here throughout the year. The facility was also designed by Frank Lloyd Wright and offers guided tours and a rooftop terrace for dining and drinking throughout the summer. From Yoga to design events, there's always something going on at Monona Terrace. Below is a quick look at some of the best events coming this summer. A noble event helping to support living a healthier lifestyle, the Go Red for Women luncheon will help unite the community. It's just one of the Many Go Red for Women events held throughout Madison, Wisconsin each year. If you love Pokémon, this family-friendly cosplay event is perfect for you. It's one of the largest annual Pokémon Regional Championships in the country with all types of gaming enthusiasts on hand. With one of the top fireworks displays in the area, the Shake The Lake Rooftop Party provides an incredible event form iHeart Media. DJs will provide entertainment and plenty of food and drink will be available. The rooftop party will also include access to the Monona Terrace Rooftop. An event full of great art, the 38th annual Art Fair Off the Square will provide plenty for art enthusiasts. Many different types of art will be available with plenty to enjoy. Monona Terrace offers many events throughout the summer. These are just a few of the top choices for fun in Madison this summer event season.